Subaru’s chief takes an early exit after a shareholders meeting on Friday. See what mess he has to mop up. Subaru Japan has been plagued by a recent fuel mileage cheating scandal and it forces an early exit for President Yasuyuki Yoshinaga. Speaking at a general meeting of its shareholders on Friday, the top Subaru boss apologized for recent inspection and data scandals that have plagued the Japanese automaker. Then he left for his new job to help mop up the mess. 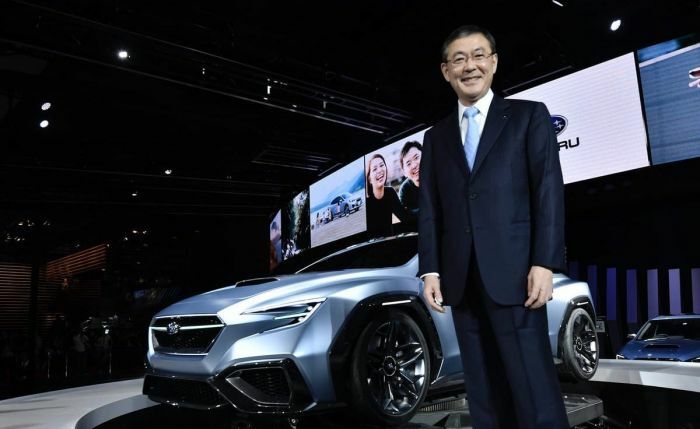 According to a report from The Japan Times, Yoshinaga said at the meeting, “We offer a heartfelt apology for repeatedly causing inconvenience and anxiety.” He vowed the automaker will do all it can to prevent similar misconduct and restore trust. Subaru stock has dropped and sales on their all-wheel-drive vehicles have slipped in Japan, while Subaru of America sales has not been affected. Yoshinaga was supposed to serve a dual role as CEO and retain the right to represent the company. But things changed for the Subaru chief June 5 when the automaker owned up to employees improperly recording fuel economy and emissions data. The number of vehicles affected by the new violations is 927 bringing the total number of affected vehicles to 1,551. Subaru inaugurated a fresh management team Friday with Tomomi Nakamura officially taking over as president and CEO from Yoshinaga who was supposed to bring his successor steadily up to speed in terms of personal connections and other elements, but the report says the succession was unexpectedly accelerated. Subaru Corp’s new executive lineup was ratified at the packed shareholders meeting. Yoshinaga spent the first 10 minutes outlining and apologizing for the raft of scandals. Yoshinaga is out, and Nakamura is in as the new Subaru boss. He will now try to repair the damage done to Subaru’s image. Hi Ganesh, Yes, Subaru should be offering more incentives to move their cars. As sales slow, look for better deals. Loved my 2012 Forester Premium, got a 2014 Forester, didn’t realize until after I bought that they had removed one of the front passenger seat adjusters and changed that seat configuration ( was higher then drivers seat) my wife’s hated it. Heard I wasn’t the only one! Traded , Got a 2016 base “ Limited “ Outback with leather & dual power seat for better comfort . Question, will the 2019 Forester be available with leather and a power right front seat, or at least with a multi - adjustable RF seat? We really loved the Foresters! Hi Jeff, The new 2019 Forster will come in leather, but Subaru did not reveal if it will include a power passenger front seat. They will reveal these details when they release pricing. Stay tuned. Thanks for reading! Dennis - With Tomomi Nakamura now serving as President and CEO of Subaru, do you know if his vision for the company differs from Yasuyuki Yoshinaga? Specifically, is Tomomi willing to to introduce more of the recent VISIV styling in future models, or will he continue to follow the bland, conservative styling that the current 2019 Forester displays? Also, is he willing to consider increasing the performance capabilities of the Crosstrek, Forester, and Outback by utilizing modern, efficient, turbo engines (such as the new 2.4L that is debuting in the 2019 Ascent)? All three vehicles could do with HP and Torque increases to the base engines, and even the modest increases planned for the new 2019 Forester do not come close to the performance from the current XT models... Lastly, how does this shakeup in leadership affect Subaru's plans for electrification of the product lineup? I know that there is a 2019 Japanese Forester hybrid planned, but we won't see it in the US anytime soon. Could this change?